DUMBARTON fought bravely but were unable to end Hibs unbeaten league record in front o an 8,200 crowd at Easter Road. DUMBARTON fought bravely but were unable to end Hibs unbeaten league record in front of an 8,200 crowd at Easter Road. Stevie Aitken's men adopted a defensive strategy, hoping to hit on the break, but they were under pressure throughout. On 20 minutes Dominique Malonga produced a superb curling shot from the edge of the area to give the home side the lead. Seconds later Dumbarton were level thanks to a fantastic 16-yard strike from Grant Gallagher, assisted by Jordan Kirkpatrick. The drama continued on 26 minutes when a poorly defended free kick left Liam Fontaine to head home straightforwardly for 2-1 to Hibs. A third for the Easter Road men came thanks to a soft looking penalty. It was converted by Jason Cummings, in the face of offside protests from Sons — not long after Stevie Saunders had made a miraculous, acrobatic clearance off the line. Hibs pressure continued relentlessly as it became ever darker in the second half, and on 59 minutes James Keatings slotted the ball in for 4-1 after outpacing Sons defence. Then Dumbarton's Steven Craig headed home his first goal for the club from a floating Mark Docherty free kick on 73 minutes. But Sons could not add to their total. 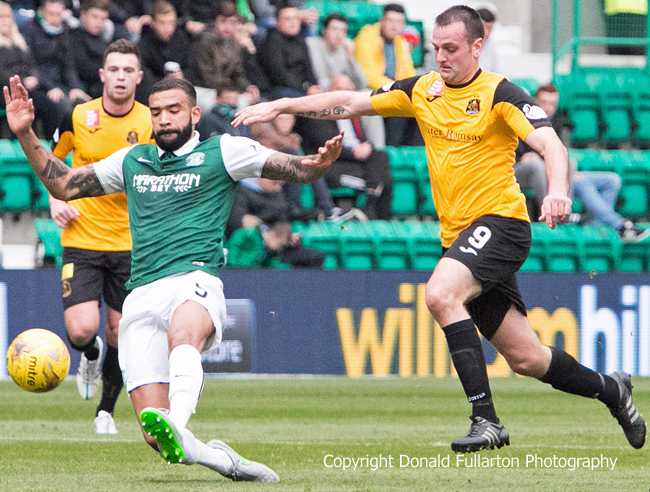 The picture shows Garry Fleming surging past Liam Fontaine and shooting.